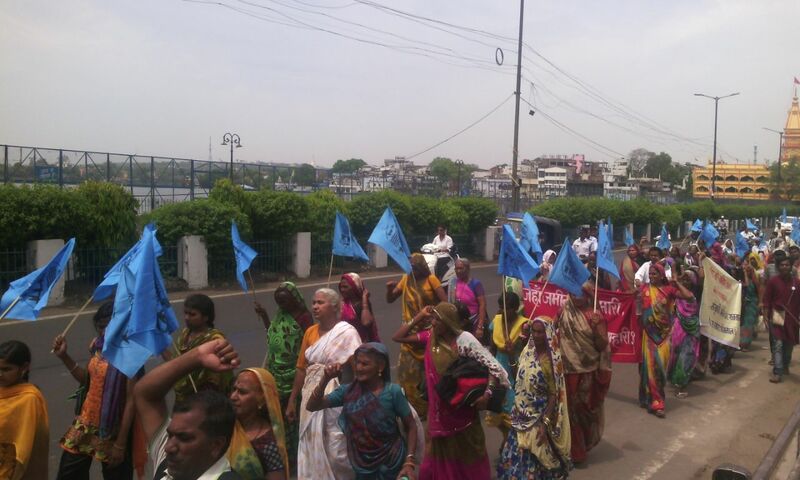 The three-day protest fast by the Narmada Bachao Andolan (NBA), ended in Bhopal on April 29, putting up strong demand to make public the Jha Commission report, which looked into corruption in the rehabilitating and resettling (R&R) of the Narmada dam oustees. A statement issued at the end of the three-day fast, the NBA said, "Large scale corruption has taken place in the name of R&R for which the High Court of Madhya Pradesh appointed the Justice Jha Commission. The report was submitted to the High Court, but the government tried everything to stop the report from getting public or going into THE hands of the petitioner, NBA." It regretted, "Whereas the construction for raising the height of the dam in Gujarat, which would submerge more than 40,000 families in Madhya Pradesh, is going on rapidly, it was mandated that before submergence the government must rehabilitate the project affected people." "Yet", the NBA said, "The government declared ‘zero balance’, i.e. no one was left for rehabilitation, which was proved wrong by an earlier fact-finding report. Now the Jha Commission report was going to expose the government claim and make the corruption public, but this has not happened." Among those who participated in the protest fast included representatives of the Communist Party of India; the All-India Trade Union Congress; the All- India Bank Employees Union; the Akhil Bhartiya Siksha Adhikaar Manch; ; the Madhya Praesh Kisan Sabha; the Swaraj Abhiyan; and several grassroots organizations. The National Alliance of People’s Movements (NAPM), which is the apex body of tens of mass organizations across India, and the Delhi Solidarity Group protested in Delhi, and submitted a memorandum to the Commissioner of the Madhya Pradesh Bhavan. Protests were also held by by the Mumbai Solidarity Group in Maharashtra, where signature campaign was carried out against the "illegal" construction to raise the dam height without complete rehabilitation. Representatives of Toko-Roko-Thoko Krantikari Morcha, Seedhi, Madhya Pradesh, protested in solidarity with the Chetavani Upvaas and submitted memorandum to the Governor of Madhya Pradesh. Representatives of Lok Shakti Abhiyaan, Odisha, demonstrated in Bhubaneswar. The NBA, meanwhile, has decided to hold a nationwide protest march in June with the slogan of “Narmada Bachao Desh Bachao” , an awareness campaign about the social injustice happening with the Narmada dam oustees. The march, said the NBA, will also aim to "bring people together against social injustice happening in the different parts of the country." Meanwhile, the NBA submitted an open letter the Madhya Pradesh chief minister, asking him to make public the Jha Commission report, saying, it would be able to clarify about lots of allegations of corruption as also large number of oustees who have still to be rehabilitated.